On Saturday against Manchester City, Arsenal's Robert Pires and Thierry Henry were aiming to re-create an infamous penalty taken by Dutch master Johan Cruyff in 1982. Back then, Cruyff passed to on-running Ajax team-mate Jesper Olsen, who drew the goalkeeper before passing back to Cruyff to score. 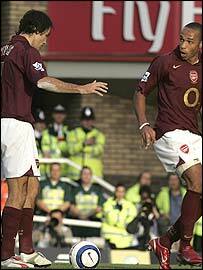 Astonishingly, the bungled attempt by Pires and Henry was let down by Pires' inability to kick the ball. Although he managed to fire a penalty into the top corner earlier in the Premiership fixture, this time Pires tried to roll the ball to the on-rushing Henry. As it happened, Pires only brushed the ball with his studs so that the ball moved fractionally but didn't actually leave the penalty spot. Once he had done this, Pires had given up his right to touch the ball again, which is why he stood motionless. Crucially, at this moment, the ball was in play - free for Henry to take a shot. But Henry had run past Pires in anticipation of a pass, and amid the confusion Manchester City's Sylvain Distin cleared the ball. The end result was an in-direct free-kick to Manchester City but, on a weekend of debatable decisions, even this is up for discussion. The Premier League confirmed that referee Mike Riley awarded the free-kick because he believed that Pires had touched the ball twice. However television replays suggest that Pires only touched the ball once, but because the contact was so minimal, the ball actually rolled back into the penalty spot. By the letter of the law Henry could have hit the ball once Pires had touched it. In order for the ball to be deemed in play it needs only to move forwards, not a full circumference of the ball as some have suggested. Whatever the outcome Pires and Henry have certainly learnt their lessons.